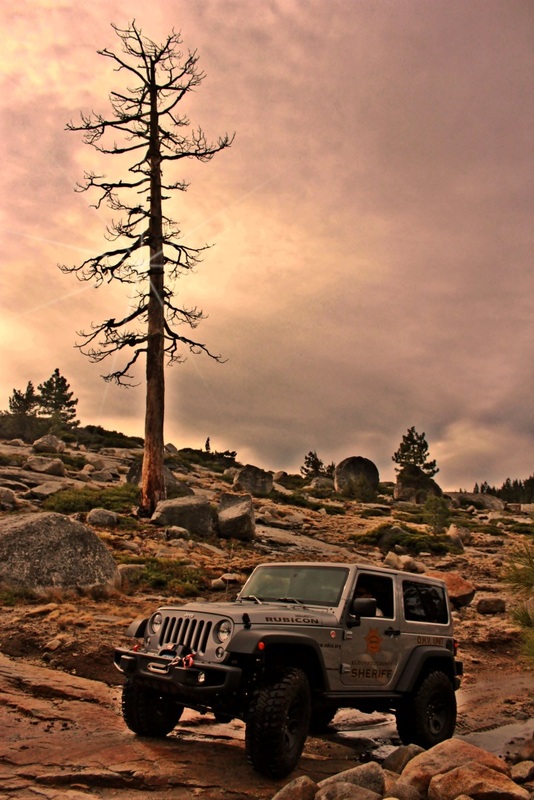 “The Rubicon Trail is a home away from home for Jeep and the hallmark for proving Jeep capability. Mark A. Smith referred to the 3 E’s of the Rubicon Trail – Engineering, Education, and Enforcement — all important components to the trail. At Jeep we wanted to do our part to support this dream and contribute to Mark’s vision for the Rubicon Trail. As a thank you to Mark, as a thank you to his family, as a tribute to his legacy and in Mark’s honor, Jeep has presented a 2015 Jeep Rubicon – Mark A. Smith Special Edition to the El Dorado County Sheriff’s Department”. Mark A. Smith was an El Dorado County Deputy Sheriff from 1953 to 1955. “Mr. Smith was a legendary outdoorsman who was widely credited with launching 4×4 off-roading as a sport more than 60 years ago and popularizing Jeeps as recreational vehicles. After settling in Georgetown in 1951, he worked with the local Rotary Club on a plan to bring visitors to the rugged El Dorado County community for an outing in Jeeps to boost the economy. In 1953, he launched the Jeepers Jamboree, which drew more than four dozen 4×4 vehicles and 155 revelers for camping and driving along the Rubicon Trail, an old wagon route between Georgetown and Lake Tahoe. The annual event draws enthusiasts from all over the world in Jeep Wranglers – and Jeep-like Toyota Cruisers and British Land Rovers – that crawl over granite slabs and boulders to Rubicon Springs. A Marine in World War II, Mr. Smith was an intrepid individual who embodied the rugged qualities of a Jeep 4×4. Besides test-driving Jeep prototypes on the Rubicon Trail for Chrysler, he traveled to many countries to introduce new vehicles and search out off-road trails. He conducted training for law-enforcement agencies and U.S. military special forces and designed driving courses for off-road testing. He organized a 20,000-mile expedition of Jeep CJ models that traveled in 1978-79 from Tierra del Fuego at the southernmost tip of South America to Prudhoe Bay, Alaska. He led the group though the infamous Darién Gap – a 100-mile gap in the Pan American Highway formed by dense jungle and swampland in Colombia and Panama – in 30 days. In 1987, he led the Camel Trophy event, a 1,000-mile off-road drive across largely uninhabited territory along the coast of Madagascar. “He was an inspiration to people about living your dreams,” said Umlauf, his former son-in-law. The son of a miner, Mr. Smith was born Dec. 13, 1926, in Globe, Ariz. He grew up in eastern Nevada and the Bay Area, where his mother was a buyer for Macy’s. He drove his first Jeep as a Marine in 1944 and was heading by ship for the invasion of Japan when World War II ended. He married his wife, Irene, in 1951 and settled in Georgetown. He worked as a logger and an El Dorado County deputy sheriff before starting a real estate business. Mr. Smith was an outspoken opponent of efforts to close public trails to recreational four-wheelers and a longtime supporter of the national “Tread Lightly” program for safe off-roading and environmental protection. In addition to the Explorers Club of New York, he was inducted into the Off-Road Motorsports Hall of Fame. Although he cut back on his own 4×4 adventures in recent years, he took an off-road trip with actor Perry King to Death Valley in December. 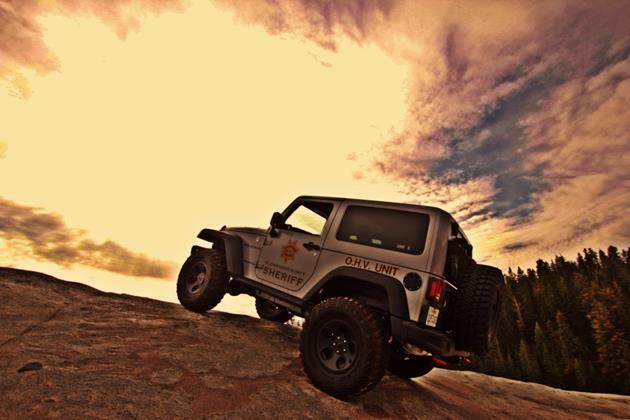 The addition of this jeep allows Deputy Sheriffs of El Dorado County to patrol and respond to the most rugged areas of the County to serve the public. The Rubicon trail, which is considered a “10” on the scale of 1-10, is one of the most difficult trails in the world and is the crown jewel of off-roading in the United States. The Sheriff’s Office is grateful for the donation and plans to carry on the tradition of education and enforcement of the Rubicon Trail in El Dorado County.